When you think about management of third parties, there is more to consider than just on-boarding due diligence. Third parties can affect the organization in a myriad of ways, from changing the risk profile for virtually every area of risk to enhancing value by ensuring strong quality, cost savings or efficiency. Throughout the lifecycle of the relationship, a smart organization will continually evaluate internal and external changes that affect the evaluation of each of its third parties and make appropriate adjustments. But how do you do that when there are hundreds, or thousands, or tens of thousands of third party relationships spread throughout silos of operation? 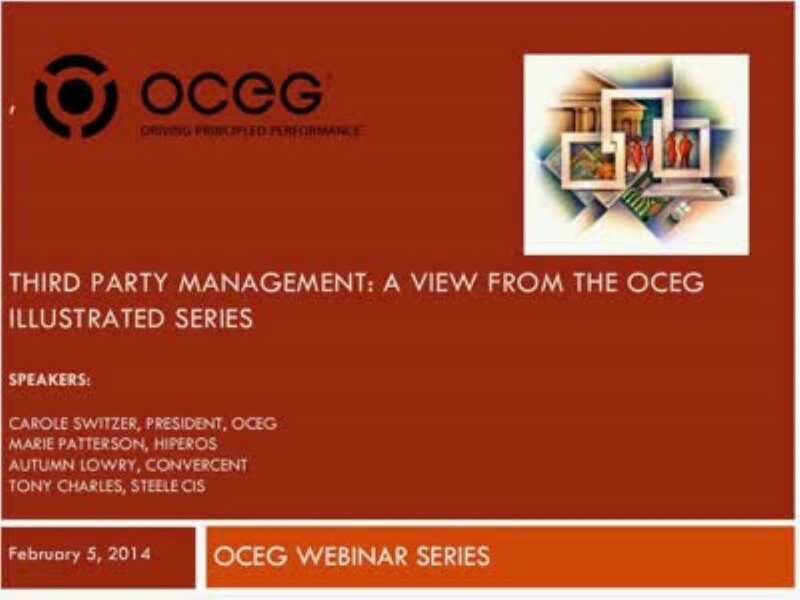 In this webinar, Marie Patterson of Hiperos, Autumn Lowry of Convercent and Tony Charles of STEELE CIS, will use the first installment of the 3rd Party Management Illustrated Series to discuss the challenges and approaches to a unified, technology supported system for integrated third party management. We have emailed instructions to access Third Party Management A View from the OCEG Illustrated Series to . Make sure the email arrives in your inbox: either add "support@oceg.org" as a safe sender to your email platform, or if you use Gmail, drag our email into your Primary tab.